The purpose of this test is to determine whether an organism is oxidative (O) or fermentative (F). The materials include 2 O/F-Glucose test tubes for each organism to be tested. The O/F-Glucose consists of peptone, 1% glucose, and a color indicator (pH indicator) usually bromthylmolblue when it is neutral. One tube is open to let the oxygen in, thus, has air inside. The other is closed usually with an overly of oil or wax to prevent air from going in. The procedure is performed by inoculating each tube with an organism (Escherichia coli, for instance) by stabbing it with a needle through each medium of the test tubes until about ¼ inch of the bottom of the tubes. 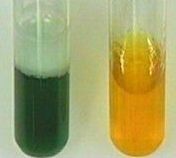 An oxidative organism produces an acid (pH indicator becomes acidic) and turns one tube yellow while the other retains the original color. 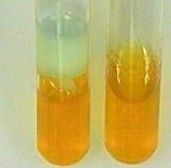 A fermentative organism turns both tubes yellow. If the organism uses the peptones instead of the glucose, the indicator becomes basic and no color change on both tubes. Organisms that oxidize the glucose are usually obligate aerobes (dies in the absences of oxygen). Organisms that ferment are usually facultative anaerobes (grows in the presence of Oxygen but grows more in the lack of Oxygen.